A Hearts supporter was seen making the sign of the cross over his forehead and chest after repeatedly making a rude gesture towards Hibernian fans. The visitors beat their local rivals 1-2 in the Edinburgh derby at Tynecastle on Saturday to leapfrog them in the Scottish Premiership table. He’s definitely not acting in the best interests of association football! 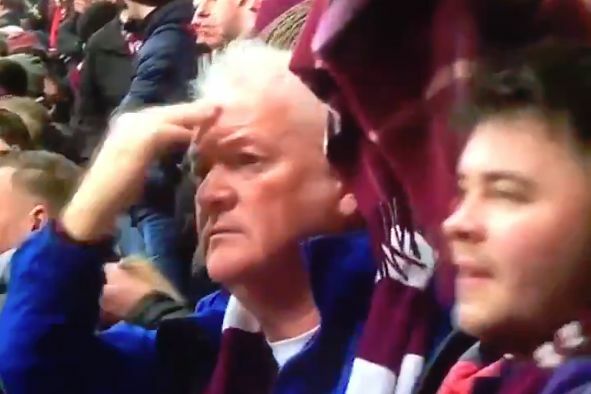 Spotted on the television coverage of the game, one Heart of Midlothian fan was filmed making the insulting bras d’honneur gesture in the direction of the travelling contingent. However the man quickly followed his actions by blessing himself, almost as if he was asking forgiveness from the Lord for his obscene behaviour ahead of kick off.